It’s another of those posts that I find hard to write and put all my feelings into. It is with sadness that we at Uniko are saying farewell to another of our FABulous Design Team members Sarah Gray from Funky Fossil Designs. Sarah has been a member of the Uniko DT since March 2015. For over 2 years I have had the honour and pleasure of having Sarah as part of the Uniko family. It seems longer than 2 years as before Sarah was a member of the DT, she was a regular customer too! 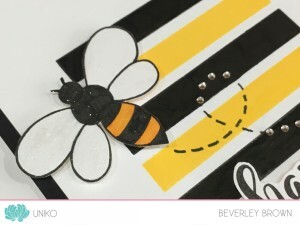 Seeing the inspiration and creativity flow when Sarah works her magic with Uniko products is simply amazing. A BIG thank you will never be enough to resonate my gratitude for all that Sarah has done for me and Uniko, she has truly been an inspiration to me and I am sure to all the Uniko customers old and new alike. 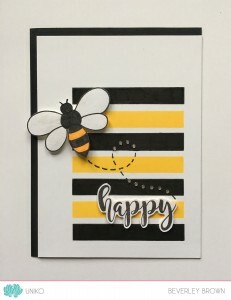 Over HERE is the start of the farewell hop & I have also shared a small selection of my favourite cards Sarah has made whilst being on the DT. This was SO hard as I love each and every one that Sarah has made!! I opted for one of the Pure Florals: Gerbera flowers, as Sarah’s use of this clear stamp set WOWs me every time and decided to go ‘Rainbow’ style too and give my new Faber-Castell Polychromos another use! 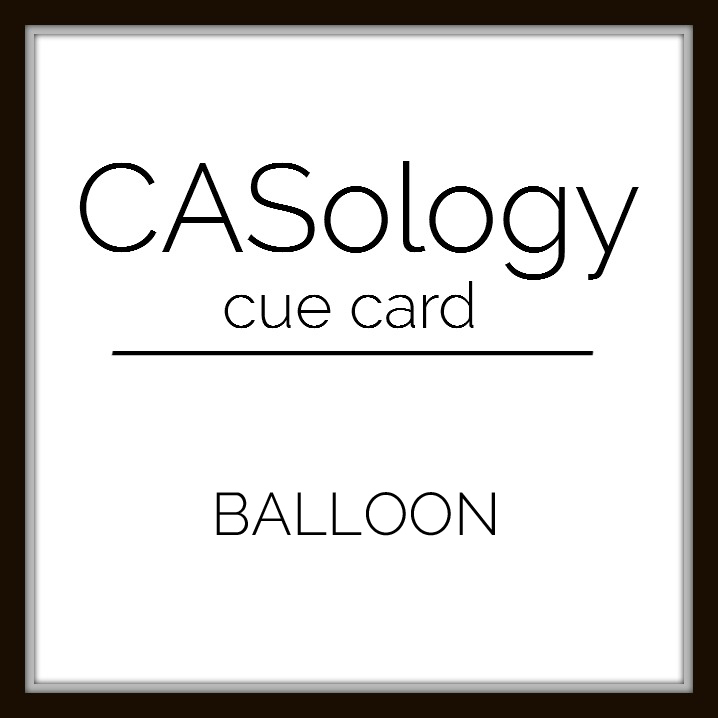 I’ve kept the design of my card pretty simple, using just the Background Blocks: Horizontal Stripe (vertically). I stamped it in Altenew Limestone ink, to let the colourful Gerbera take centre stage. 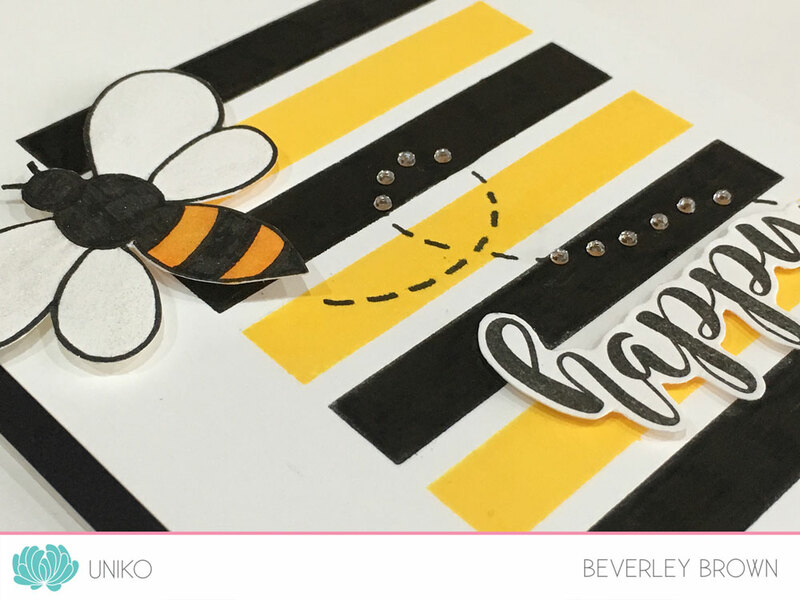 I was wanting to add the ‘perfect’ thanks sentiment, but I really need to design the ‘perfect’ thank you set 😉 Instead I opted for a sentiment from Originally Organic Additions. I chose this particular sentiment as Sarah is a blessing and a wonderful friend. 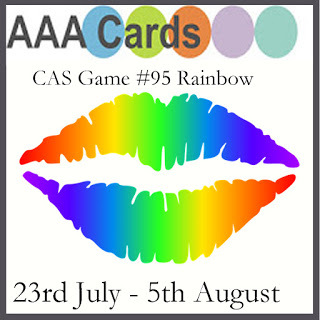 I’m going to enter this in to the challenge over at AAA Cards too, as their current challenge HERE is rainbow. That’s all I have to share creatively today, but be sure to follow the links below to see what the Design Team created. THANK YOU Sarah for everything! You had been a blessing to Uniko and you WILL be truly missed by us all. 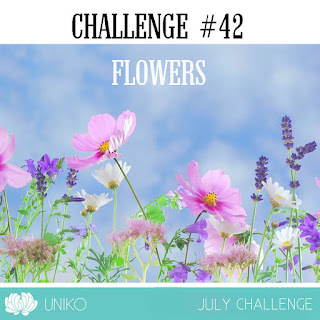 Welcome to the July/August 2017 Uniko challenge. I have changed the frequency and length of the challenges this year to hopefully give you a little more time to join in on the fun. 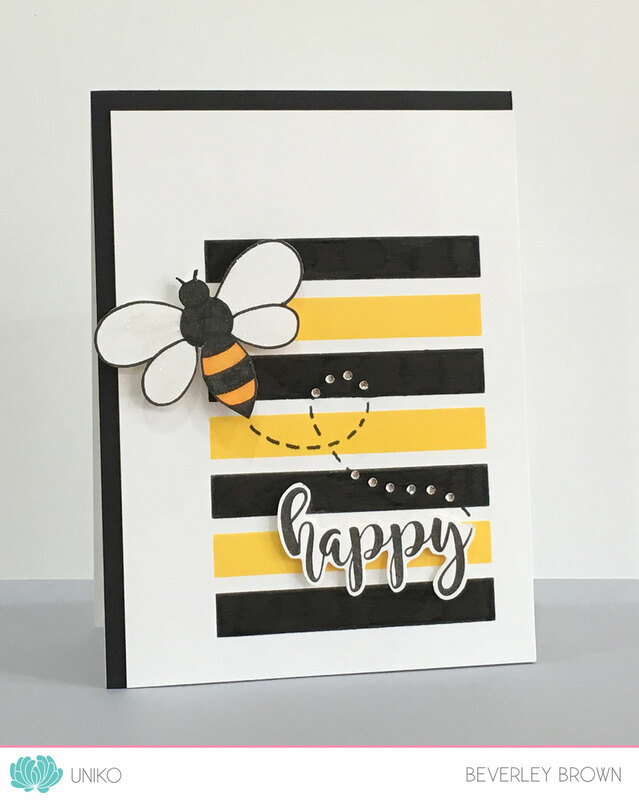 This should be a really easy and popular theme and we’re so looking forward to seeing all your wonderful cards popping up in the gallery. 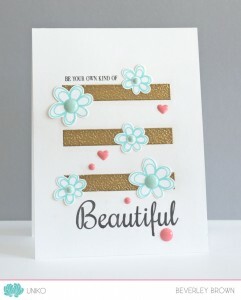 This month we have two Guest Designers – Cornelia the winner of Challenge #40 and Elaine the winner of Challenge #41. Both awesomely talented ladies who we are proud to have joining us for this new challenge. Fabulous isn’t it? 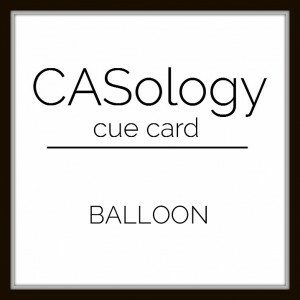 Be sure to pop on over to her blog HERE and leave her some love. So gorgeous! You’ll be wanting to pop over to her blog HERE to leave her some love too. 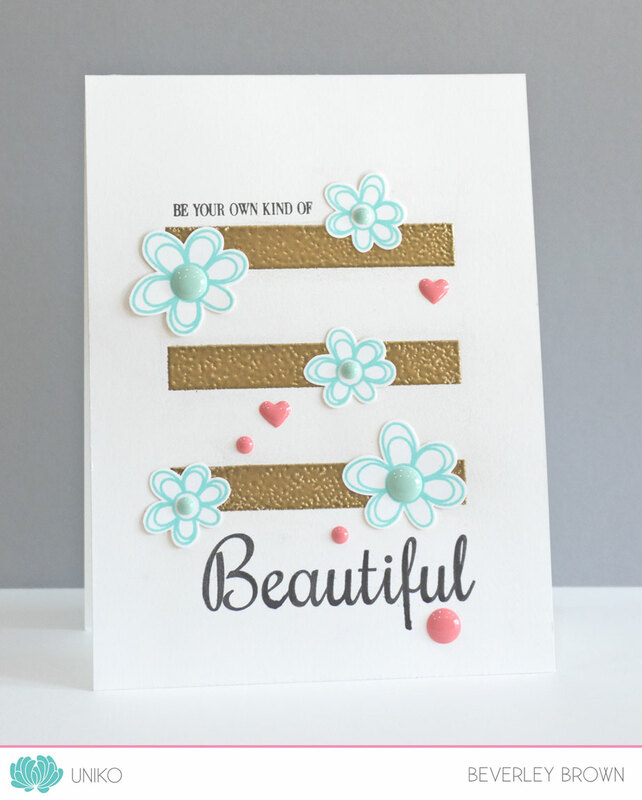 I’d not used Beautiful Blooms II for a while, so I decided to ink the flowers & leaves up from that set, using some summery Altenew ink colours. I used all three of the flowers contained in the set for my little bouquet. When I had stamped & fussy cut the flowers and laid them onto my card I decided they needed a little ‘backdrop’ to sit against. 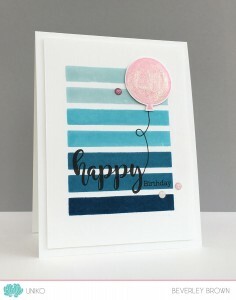 So I reached for the recently restocked and popular Background Blocks Horizontal Stripe, using it as a vertical stripe instead across my landscape card. 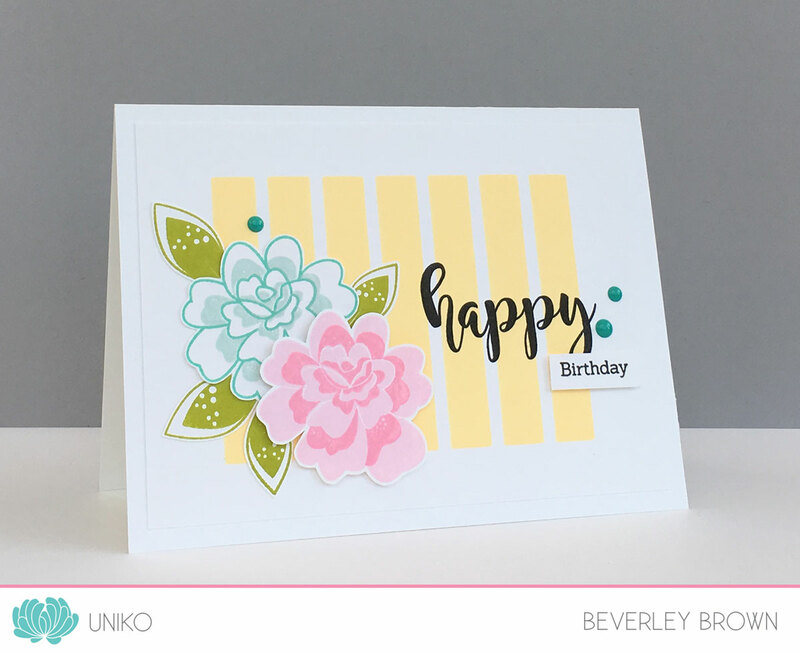 The sentiment is from Happy Succulents (also NOW back in stock) and I added more interest by stamping the ‘birthday’ part on a small strip of white card and adhering with foam adhesive. A trio of Stampin’ Up! enamel dots finished it off nicely! You’ve got plenty of time to play along with this month’s challenge. The deadline for submission is midnight (GMT) on Friday 25th August 2017 (7.00pm EDT). I’m SO happy that you have stopped by today, as here at Uniko preparations for the May product release are well underway. 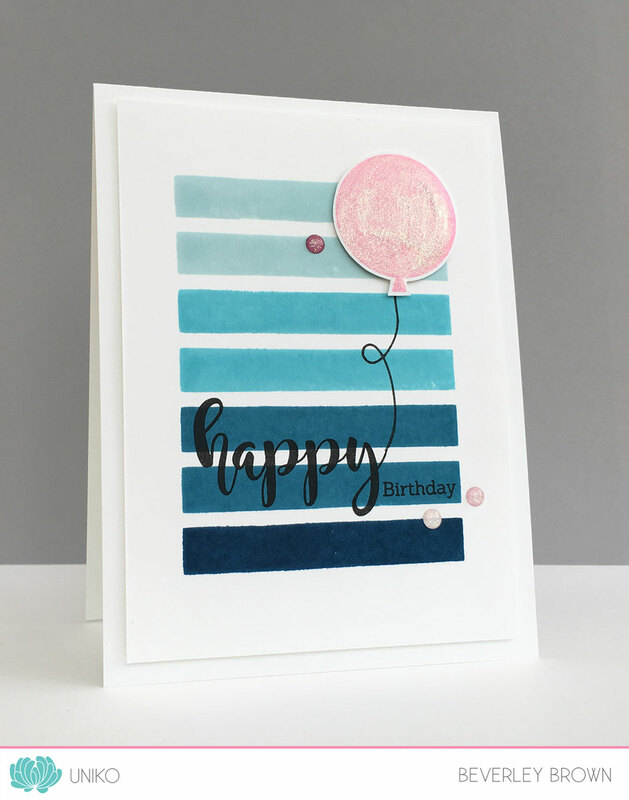 We have had all the sneak peeks at the 4 clear stamp sets being released and NOW it is time for the Design Team and I to introduce them to you. Starting over HERE, myself and my AWESOME Design Team are introducing TWO clear stamp sets, Background Blocks Doodle Flower & Horizontal Stripe. 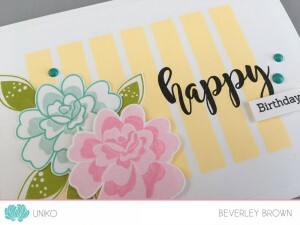 These two sets have so many fun possibilities and can be used and paired with all sorts of stamps and paper crafting goodies. First up a rainbow card, who doesn’t love a colourful rainbow?! 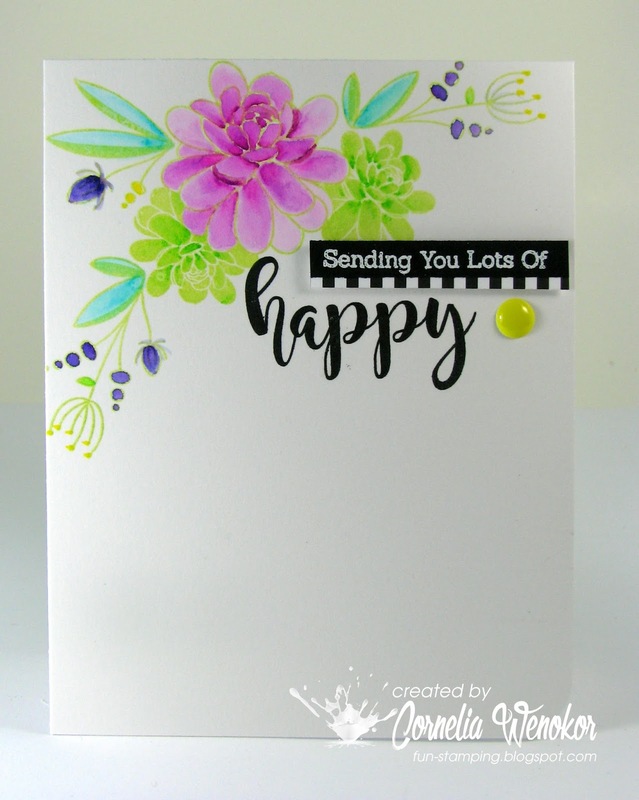 Now, I have to say that the MISTI tool comes in very VERY handy for multi coloured stamping AND for perfect placement of the doodle flower stamp over the top! The rainbow of stripes is stamped using Lawn Fawn inks and the doodle flower is stamped in VersaFine Onyx Black ink. 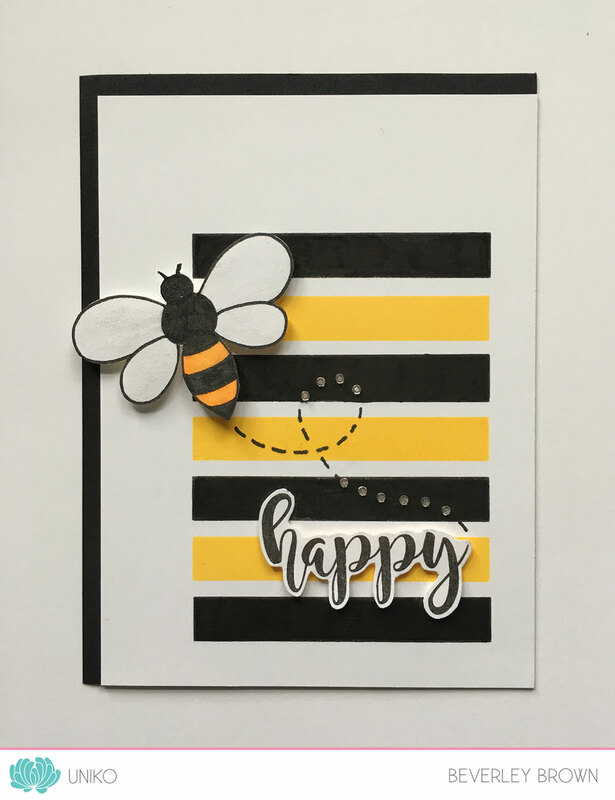 I added a sentiment from Simply Said and some Stampin’ Up! 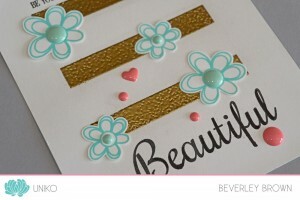 heart shape enamel embellishments to 3 of the larger flowers. 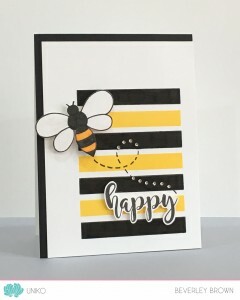 Again I used my MISTI tool to stamp the horizontal stripes and this time I selectively inked just 3 of the stripes in VersaMark ink and heat embossed them with Gold EP. 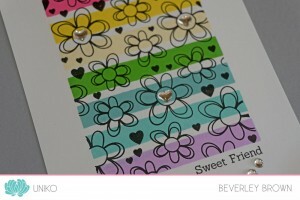 The stripes are then embellished with Lawn Fawn Merman doodle flowers, Stampin’ Up! 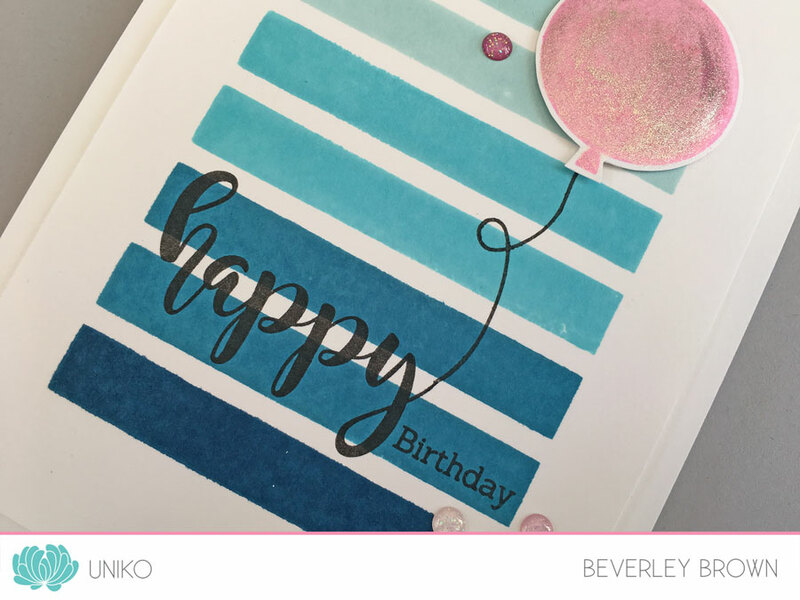 Enamel dots and a sentiment from All Occasion Sentiments #6. Ok, that’s all I have to share today using these two new stamps and hopefully I have inspired you a little as to how they can be used! 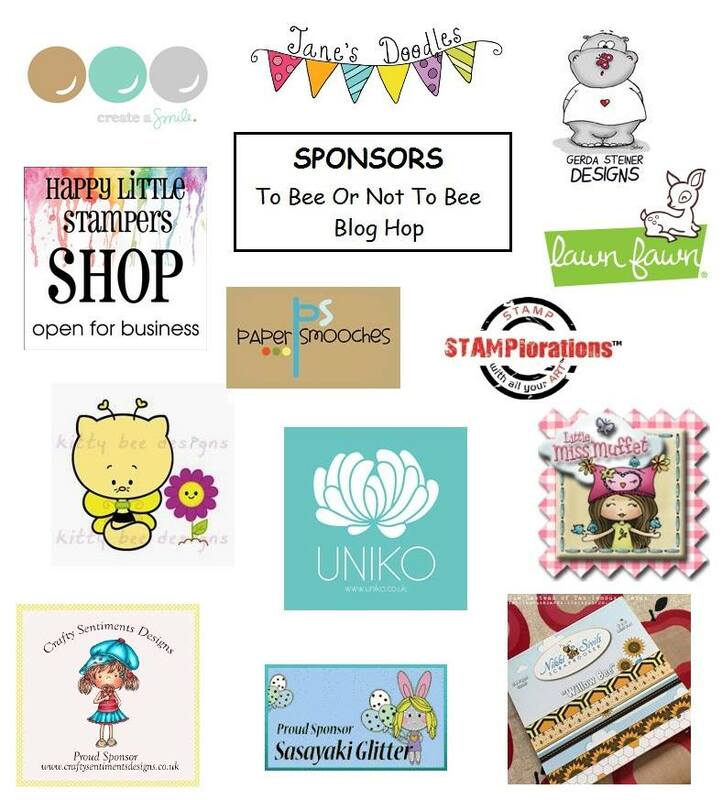 Now I am handing you over to the Design Team and you WILL be inspired with how they have all used the stamps. Be sure to comment along the hop, as you might just be chosen for a random release day prize! 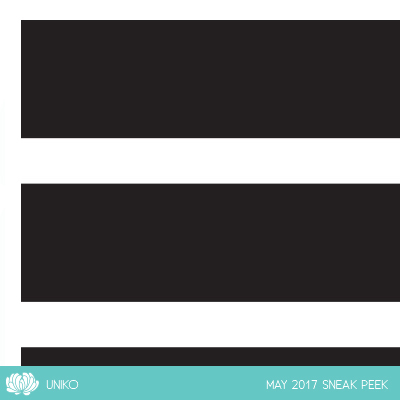 Not only is today Hubby’s birthday and a Bank Holiday here in the UK, it is also the day I get to show you a couple of the ‘official’ sneak peeks for the May 2017 Release. Thank you for your patience in waiting for this release, I know many of you have been waiting for it! I decided to time it to coincide with Happy Stampers Festival, which is on Saturday – YAY!